0.1 Question: What does firescale look like? 0.3 Question: My ring has firescale, how can I remove it? 0.4 Question and Answer: How to remove firescale/stain. 0.5 Question: I have firescale/stain on my piece – how to remove it? 0.6 Question: Should I protect my piece from firescale/firestain with an anti-firescale coating when soldering? 0.7 Question: Does Pripps Flux work better than boric acid and denatured alcohol for preventing firescale/firestain? 0.8 What is the best way to avoid firescale/stain altogether? Question: What does firescale look like? How does fire scale present on a polished piece of silver jewelry? Please see updated information on firescale and fire stain on my webpage: Soldering 101 – Oxidation, Flux and Firescale Prevention. Updated: 1/27/17. (firescale/stain on silver) I think this link to my page: Soldering 101, will help. 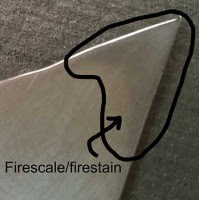 Firescale/fire-stain usually shows up (clearly) when polished. It looks like a purple bruise. If you are getting a lot of firescale, look into reducing your heat, completely coating your metal with flux or an anti-scale product, or don’t finish to a high shine (see soldering 101 page for explanation). You can also switch to Argentium. More information on firescale can be found at my Soldering 101 – Oxidation, Flux and Firescale Prevention page. You can try a product like this: FirescoffTM. Question: My ring has firescale, how can I remove it? Firescale and Surface Oxidation both occur in metals containing copper like your gold filled metal as well as sterling silver, brass and bronze – among others. Both Firescale and Surface Oxidation look like the tarnish that forms on sterling silver although, oxidation usually has other colors in it too like: browns and reds. Surface Oxidation disappears after it is pickled (after soldering). Did you pickle your piece after soldering? Unfortunately, the only way that I’ve found to remove firescale/firestain (easily) is to sand it off. It’s a bit more challenging with GF as you don’t want to sand off the plating. So, take it easy. I recommend buying the thickest GF you can find which, will allow for situations like firescale – especially when you will be soldering it. Update 1/27/17: Please see this link on my site: Soldering 101 – Oxidation, Flux and Firescale Prevention for other methods to remove firescale/fire stain. Here’s some information from Rio Grande on Gold Filled metal. Here’s a video from them on soldering GF. Also, my page on Vermeil, Gold Plate and Gold Filled. Please see my webpages on Oxidation, Flux and Firescale/stain Prevention as well as On Pickle, Acid, Crock pots and Baking Soda. Another method for avoiding firescale is to not overheat the piece. The image above took me three tries and I almost melted the silver, trying to get the firescale to form. So, I guess the first objective, for you is to determine whether you’ve got simple oxidation or firescale and then proceed with the solution(s). Question and Answer: How to remove firescale/stain. You state you: leave too many “fire marks” – what do you mean by that? Are you using pickle to clean the metal after soldering? Or are you seeing that gray bruising after polishing (firescale)? If you are seeing firescale, try doing something like what is in this Rio Grande article. If you have oxidation from soldering, try a nickel pickle: Here’s one article from Hoover and Strong. Here’s a product – Rio Clean Pickle – designed for nickel, brass and bronze. For getting into all the nooks and crannies, for further cleanup, try the 3m Radial Bristle Discs. They work great! To learn more about finishing please view my webpage: Finishing Jewelry and my video: How To Finish Jewelry. Question: I have firescale/stain on my piece – how to remove it? I’m a total newbie and also don’t have any equipment yet. I am taking a jewelry class. I just made 2 pieces and didn’t manage to polish the fire scale off before running out of time. What would you recommend to try to polish the fire scale away? It’s mostly around/under bronze stars that are soldered on to the sterling piece. It’s tricky to get at but very noticeable. Desperate to remove it! I’d really like to try to achieve a mirror finish. Seems like sandpaper/finishing paper might be the way to go. My other thought is to take it to a local jeweler and see if they can do anything with it. I’m attaching pictures of the pieces so you can see what I’m talking about. Recommendations of specific papers to buy would be really helpful. Please see my webpage: Soldering 101 – Oxidation, Flux and Firescale Prevention for updated information on the formation of firescale/fire stain and how to avoid and remove it. Firescale/firestain is difficult to remove and the only predictable way to remove it, that I’ve found, is with sanding or etching. You could try using 50% sodium bisulfate based pickle and 50% hydrogen peroxide. One of my viewers swears that that works. I need to experiment with it. Check the metal every couple of minutes to see what’s happening. You should see bubbling around any areas that contain copper. Usually, the metal will have a matt finish, after the immersion in pickle and peroxide so, you might have to burnish with a brass brush or use a buff with rouge. It may work – it may not. You can fold your sandpaper into shapes – which gives you a finer point to get into hard to reach areas and creates rigidity to help you sand. Roll or fold it into a point or wrap around a pencil, to get into those hard to reach areas (see images). I use wet/dry sandpaper. I buy it at my local hardware store or you can get it here, at Amazon. I recommend working with the sandpaper wet as that: 1. keeps the dust down and 2. extends the life of the sandpaper because the particles get rinsed out and don’t build up and clog. Another option is apply a patina, like liver of sulfur, to hide the stain. If you have a dremel or a flex shaft you can use 3m bristle discs, 3M polishing pins or polishing points. That is all that I know of for removing firescale. You can try preventing it by using an anti-scale coating or Pripp’s flux or by not allowing the metal to get so hot – or both! Question: Should I protect my piece from firescale/firestain with an anti-firescale coating when soldering? Total immersion or coverage would only be important if you were concerned with fire scale/fire stain because you were creating a mirror finish, at the end. According to the research, that I just completed, if you are working with sterling silver, bronze, brass or gold (besides 24K) you should either: 1. flux the entire piece or 2. use a fire scale preventative. Check to be sure that the preventative can also be used as a flux. See my updated information on oxidation, fire scale and fire stain. The reasoning behind total immersion is that the flux or preventative will reduce the amount of interaction between the 02 in the air and the metal, helping to reduce the quantity of oxidation and therefore, perhaps, reducing the chances for fire stain/fire scale to form on the entire piece. Whereas, painting flux only at the join point only facilitates soldering and offers no protection to the rest of the metal. Check the highest temperatures that your flux can survive at – fluxes are not all created equal. Handy Flux is effective at 1,100°–1,600°F (593°–871°C). Caution: Don’t purchase the wrong type of Handy Flux! There is also a B-1 type for nickel silver and stainless steel. Battern’s Flux: 1100°F to 1700°F, (593°-927°C). Grifflux: 1,100°–1,500°F (593°–816°C). My-T-Flux, at Rio Grande, is effective from 1,100°-1,700°F (593°-927°C) – 200°F higher than the Grifflux. Once you exceed the effective temperature range of the flux, it is no longer doing its job. So, reducing heat helps to avoid stain/scale by allowing the flux to remain active. Check your flux’s temperature ranges and try to keep your heat from exceeding them. Borax/Boric Acid and denatured alcohol anti-firescale and flux have effective temperatures in similar ranges so, without actually testing each type against one another, I can’t recommend one over the other. That said, I’d go with the My-T-Flux because it has the highest effective temperature range. Question: Does Pripps Flux work better than boric acid and denatured alcohol for preventing firescale/firestain? Do you create a high polish on your finished pieces? That is when the firescale/stain shows up. It doesn’t always happen though. I don’t think anyone type of preventative works any better than another – although, people can get pretty heated up in the defense of their firescale/stain preventative. I use just plain flux and try to avoid overheating. Anything that reduces the amount of oxide development, works. The temperature range of the flux/dip is crucial – if pieces are heated past the max temp range, the flux/dip stops working. Most have working ranges of up to 1800°F. I think, that if you aren’t seeing firescale/stain, then you are doing something right and I’d keep doing whatever you are doing. Although, you do have most of the ingredients so, you could make some up and see what you think. Wish I could be less vague but, I haven’t found anything that I feel is superior to another – yet! *There are other fluxes/dips that have higher ranges but, they are usually used for platinum. Also, soldering on charcoal helps because it creates a reducing atmosphere. I don’t think the Pripps would be easier for students. Although, I haven’t tested that theory. What is the best way to avoid firescale/stain altogether?